Obv/ IMP CM AVR PROBVS PF AVG; rad., dr. and cuir. bust r.
Rev/ CLEMENTIA TEMP; emp. std. l. holding eagle-headed scptre, receiving globe from Jupiter std. r; Gamma below. 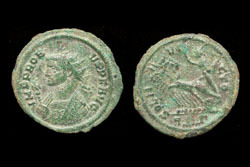 Siscia Mint; XXI in exergue.